On 11th November 2018 the Hornchurch Ringers participated in the Ringing Remembers campaign as part of the Armistice 100 activities. Here is a collection of photos from the event. 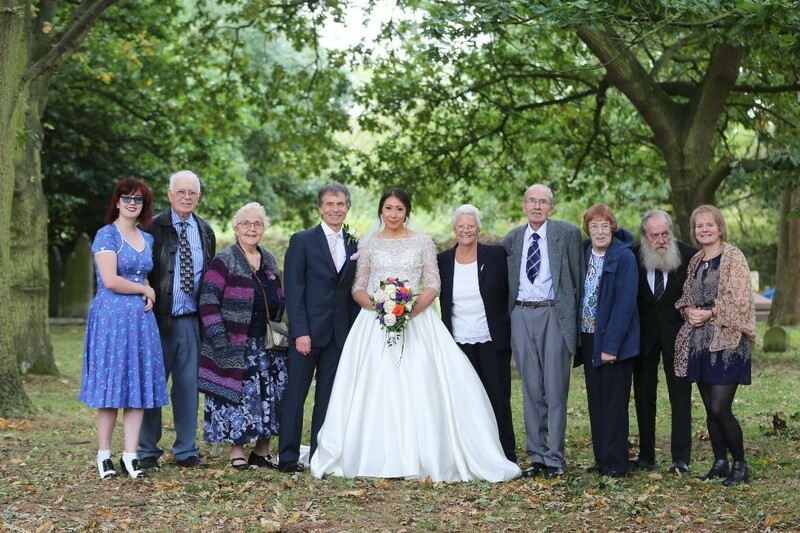 September the 22nd was a momentous day for Hornchurch Ringing when The Master, Clive Stephenson married fellow ringer Michelle Long. Festivities began on August 27th with a celebratory peal, and a quarter peal was rung prior to the wedding. Immediately before and after the service the bells were rung by different bands, so that everybody got a chance to join in the occasion. Whilst the weather could have been better, throughout the day the timing and organisation were impeccable. 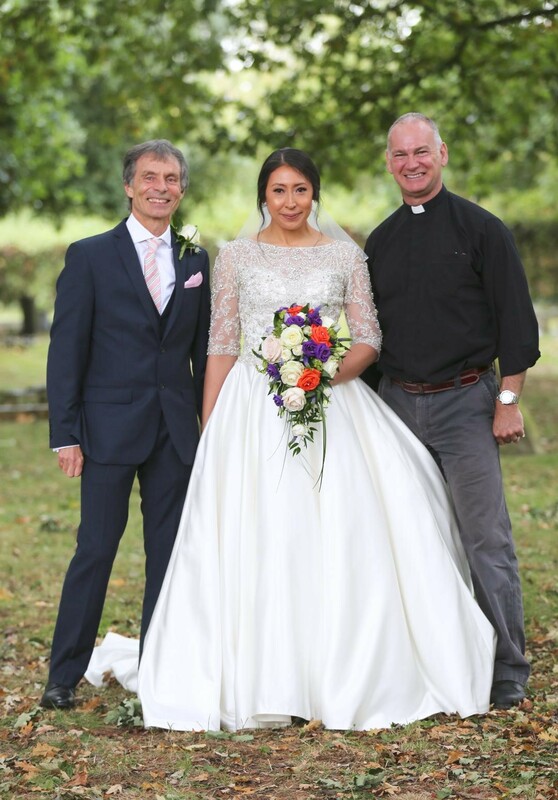 Michelle, looking stunning, arrived and was escorted down the aisle by her mother, Janice, to Clarke’s Trumpet Voluntary, and the wedding was conducted by our vicar, Revd. Barry Hobson, while the organ was played by ringer and priest Phil Denton. Clive’s best man was lifelong friend David Saunders. During the Signing of the Register handbells were rung by the Loughton Handbell Ringers, conducted by Andrew Barham. Following the service, a hundred plus ringers, family and friends were entertained in the Church Hall and supplied with copious amounts of sandwiches, cakes, savouries and drinks and photographs were taken in the Church Grounds. Later the Wedding Breakfast was held at The De Rougemont Manor in nearby Great Warley and attended by about seventy people. A superb meal was served and Clive and The Best Man made well prepared and witty speeches. Clive alluded to his questionable dancing skills, to be demonstrated later, and told of his unique method of proposal, a note encased in Valentine’s Day chocolate, while David in a traditional Best Man’s speech toasted the Bride and Groom with the various groups present: Family, St Edwards School Alumni, Friends, Ringers and Pharmacists. Later a disco was set up and dancing continued till after midnight while guests mingled, danced, renewed old acquaintances and generally enjoyed themselves. Clive and Michelle with some of the Hornchurch Bellringers. Clive and Michelle with Barry Hobson, Vicar. Normally bell ringers perform for 5 to 10 minutes at a time and then stop to give their arms and brains a rest and give someone else a go. After a ringer has been learning for a few years, however, they can attempt a quarter peal which is at least 1250 changes (1250 rings or 1250 pulls) and takes about 45 minutes to complete. This is quite a big step and a big achievement, if successful. On 1st May 2016, prior to the Memorial Evensong, Jacky Stockwell from St Andrew’s bell ringers, successfully completed her first quarter peal at the first attempt. Jacky started to learn to ring about 3 years ago and has made good progress during that time showing regular commitment to practice nights and Sunday ringing. Congratulations to Jacky from all her ringing friends! Rung prior to Memorial Evensong particularly remembering Peter Saddleton who rang at Hornchurch in the 1970’s and died on 18th April. Although we don’t know the exact date, William Shakespeare was born on or around 23rd April 1564 in Stratford-Upon-Avon. At the time, Stratford was in the grip of an outbreak of plague and he was lucky to survive. On 22nd April 1616, a group of friends gathered to celebrate Shakespeare’s 52nd birthday but it was to be his last: ‘Shakespeare and friends had a merry meeting and it seems drank too hard, for Shakespeare died of a fever there contracted’. Every year, on or around the 23rd April, the anniversary of William Shakespeare is celebrated in Stratford-Upon-Avon. This year marks the 400th anniversary of his death and on 30th April, St Andrew’s bell ringers chose Stratford-Upon-Avon as a venue for their spring outing. We rang the bells of Holy Trinity Church and also took the opportunity to visit Shakespeare’s grave inside the church. L-R: Eileen Drew, Lionel Woods, Rosemarie Edwards, John Stephenson, Jane Harper,John Thornhill and Terry Thornhill. Date touch for Evensong and to commemorate the 400th anniversary of the death of William Shakespeare. John and Blanche Stephenson celebrating their Diamond Wedding. On 27th August 2015, John Stephenson of St Andrew’s bellringers, and his wife Blanche, celebrated their 60th Wedding Anniversary. The ringers from Hornchurch and South Ockendon that took part in the general ringing. This year saw the 800th Anniversary of Magna Carta and bell ringers from across Havering took part in the National celebrations. On 15th June 1215, the first version of Magna Carta or ‘Charter of Liberties’ was signed at Runnymede Meadows by King John. This removed absolute power from the King and paved the way for parliament and the many freedoms that we enjoy today. 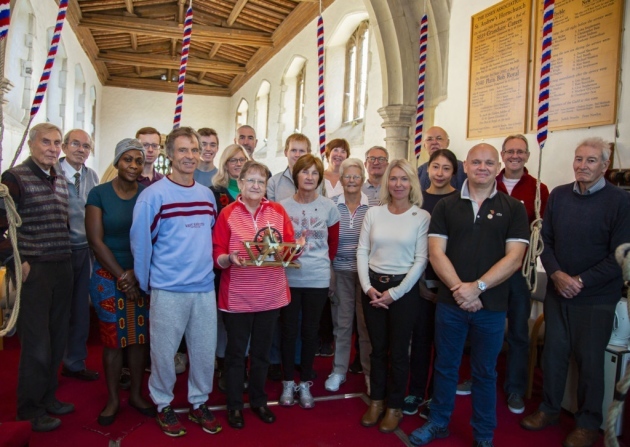 Bell ringers from St Andrew’s, Hornchurch and Holy Cross, South Ockendon joined forces to support the National Campaign to ring for the 70th Anniversary of VE Day on 9th May 2015. The ringing took place at Hornchurch and included rounds on 10 and call changes on 8. The event was well supported with 18 ringers from both churches taking part. Congratulations to all involved especially those ringing for a special event for the first time. St Andrew’s bells have been rung for many Royal occasions over the years. When 2nd May was arranged as the date to ring a peal for the Royal Birth, we thought that we were going to be too early but when we assembled just before 10.00am, we knew that the Duchess of Cambridge was already in labour. Anzac Day has always had a special meaning for the residents of Hornchurch in Essex due to the stationing of New Zealand and Maori soldiers there during the First World War.